This site has been developed to highlight the potential role for Earth observations in particular in supporting the global Indicator framework for the SDGs. It has been developed through a cooperation between the Group on Earth Observations (GEO) and the Committee on Earth Observation Satellites (CEOS – the peak body for coordination of satellite Earth observation programmes of all the world’s civil space agencies). A successful sustainable development agenda will require effective partnerships for implementation. This report describes how GEO, CEOS and space agencies are working with governments, academia, scientists, and the private sector in developing such partnerships for implementation of the Sustainable Development Goals. 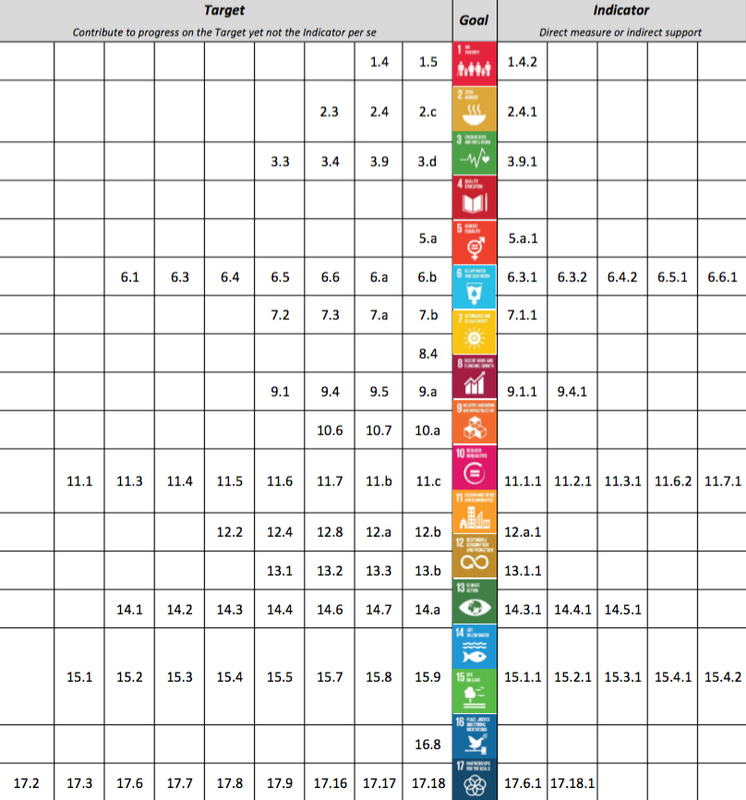 In adopting the 2030 Agenda for Sustainable Development, world leaders agreed that a global Indicator framework was necessary to measure, monitor and report progress towards the 17 transformational Sustainable Development Goals (SDGs) and 169 associated Targets. They also recognised the critical importance of “transparent and accountable scaling-up of appropriate public-private cooperation to exploit the contribution to be made by a wide range of data, including Earth observation and geospatial information, while ensuring national ownership in supporting and tracking progress”. 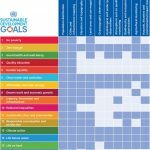 To track progress towards these Goals and Targets, the global Indicator framework must capture the multi-faceted and ambitious aspirations for the continued development of nations and societies. Effective reporting of progress toward these Indicators will require the use of multiple types of data, both what we have in hand – traditional national accounts, household surveys and routine administrative data – and new sources of data outside national statistical systems, notably Earth observations (EO) and geospatial information (GI), using modern data processing techniques more appropriate to large volumes of EO data. The integration of all these data can produce a quantum leap in how we monitor and track development and advance the well-being of our societies. Since Earth observation and geospatial information are often continuous in their spatial and temporal resolutions, their use in SDG monitoring can prove essential in capturing the sustainability of developments underpinning the SDG framework. Earth observation and geospatial information, which include satellite, airborne, land- and marine-based data, as well as model outputs, will expand monitoring capabilities at local, national, regional and global levels, and across sectors. Earth observation and geospatial information can significantly reduce the costs of monitoring the aspirations reflected in the Goals and Targets, and make SDG monitoring and reporting viable within the limited resources available to governments. Section 2 explains the broad potential for satellite Earth observations to contribute to the SDGs. Section 3 contains a number of case studies supplied by governments and agencies to demonstrate specific applications of Earth observations in relation to the SDGs and national ambitions. Section 4 speaks to national statistical organisations and UN organisations considering the application of Earth observations and provides guidance around the challenges and opportunities to their use for SDG purposes. Brief conclusions and sources of further information are provided in section 5. GEO document used for a side-event at the 47th Session of the United Nations Statistical Commission Statistical-Geospatial Integration Forum - Geospatial Information and Earth Observations: Supporting Official Statistics in Monitoring the SDGs (March, 2016). Credit: GEO. Click to enlarge. 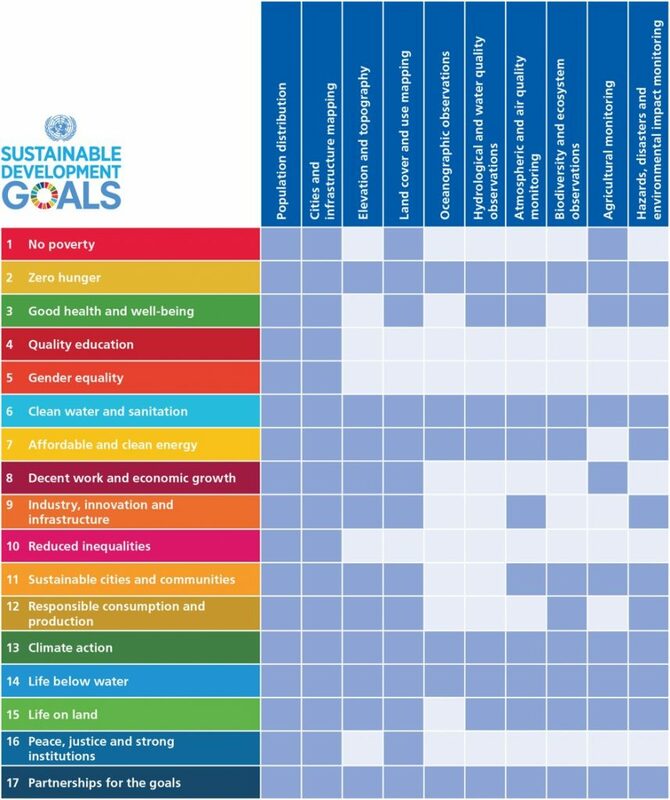 SDG Targets and Indicators that can be supported by Earth observations. Credit: EO4SDGs / CEOS. Click to enlarge. Governments, industry, and scientists have long recognised the critical importance of Earth observations as an information source in support of many sectors of society. Earth observations (from satellite, airborne, and in-situ sensors) provide accurate and reliable information on the state of the atmosphere, oceans, coasts, rivers, soil, crops, forests, ecosystems, natural resources, ice, snow and built infrastructure, and their change over time, are directly or indirectly necessary for all functions of government, all economic sectors and almost all day-to-day activities of society. Earth observation programmes represent the largest investment globally in relation to applications of satellites by national governments – typically through their national space agencies – recognising their capacity to address such critical challenges as climate change, water availability, food security, natural disaster mitigation, safe and secure transport, energy and resources security, agriculture forestry and ecosystems, coasts and oceans, health issues, and national security. In adopting the 2030 Agenda for Sustainable Development, world leaders recognised the important role that Earth observations and geospatial information could play in making the whole framework feasible through the provision of essential evidence, including the tracking of Indicators over time, and supporting the implementation of solutions to reach specific Targets. Effective use of the information in Earth observations can have a transformational impact on many of humanity’s most significant challenges, such as helping scientists globally, resource and planning managers and politicians better monitor and protect fragile ecosystems, ensure resilient infrastructure, manage climate risks, enhance food security, build more resilient cities, reduce poverty, and improve governance, among others. and the need to evolve from traditional statistical approaches to more measurement-based solutions as some challenges – including in relation to the environment and human populations – become more pressing, and with the need for more accurate, spatially explicit, and frequently updated evidence. Diversity of measurements: advances in science and in instrumentation have resulted in an increasingly diverse array of EO satellite missions with dozens of geophysical parameters being measured on a daily basis from a range of different satellite orbits. In the field of climate change alone, CEOS has identified that of the ~ 55 Essential Climate Variables (or ECVs) more than half have a major contribution from satellite observations or simply would not be feasible without satellites (such as polar ice extent, and global sea level). Complementarity with traditional statistical methods: while EO datasets can be used to monitor directly some specific Indicators of SDGs, they can also offer a unique and complementary source of information to cross-check the validity of in-situ data measurements (such as survey and inventory data), communicate and visualize the geographic dimensions and context of the Indicators as needed, and provide disaggregation of the Indicators where appropriate. Free and open data is on the increase: not all nations are able to develop and launch their own Earth observation satellites, with a relatively small (but growing) number having the capacity to do so. Hence the availability of the data from these missions, for all nations, is of fundamental importance to their uptake and global impact. US mission data has long been freely available, and with the advent of the free and open data policy of Europe’s Copernicus programme of multiple satellite data streams, the prospects for access to the EO data required by developing countries have improved considerably. High performance computing and cloud storage and processing capabilities are making it simpler to handle and apply EO satellite datasets which can be large and complex. And space agencies are prioritising efforts to further remove the burden on potential users by making more data ‘analysis ready’ (analysis ready data or ARD). An analysis by GEO and CEOS has identified specific Targets and Indicators that can be supported by Earth observations, summarised in Figure 2. For readers unfamiliar with the details of the individual Goals, Targets and Indicators listed, these can be identified from this document. Earth observation data makes the prospect of a global Indicator framework for the SDGs viable. For many Indicators, the coverage and frequency of measurements from which the Indicators are derived would simply not be feasible, technically or financially. Increasing availability and usability of the data allows NSOs and UN agencies to design the framework to make optimal use of current and planned satellite data streams. Earth observations are able to provide new and consistent data sources and methodologies to integrate multiple ‘location-based’ variables to support and inform official statistics and the Indicators for the SDGs. An increasing number of NSOs are discovering the opportunities around use of new and consistent data sources and methodologies to integrate various ‘geo’ variables to support and inform official statistics. allow consistent and comparable measurements across different countries and regions. Modern computing and data handling capabilities permit the integration of information from a range of different sources. The GEOSS ‘system of systems’, through its Common Infrastructure (GCI), links more than 150 different data catalogs containing more than 200 million resources, accessible through an easy-to-use GEOSS Portal. There were more than 4.4 million inquiries to the GCI in 2016 alone. The UN Global Working Group (GWG) on Big Data for Official Statistics is exploring the potential of satellite imagery and geospatial data, including how to make use of existing methods for estimating official statistics (eg to support the SDGs) at high temporal and spatial resolutions (report to be released in 2017). Some international coordination organisations already exist to assist NSOs and UN agencies to navigate the transition to inclusion of EO data in the SDG Indicator framework and the development of the supporting national information. GEO’s EO4SDGs Initiative focuses on realising the potential that Earth observations and geospatial information offer to the SDGs, supports collaboration with national statistical offices, and builds capacity within GEO on statistical practices for the purposes of the SDGs. The initiative promotes the emergence and scaling-up of joint efforts and collaborations between these national statistical offices, international statistical agencies, UN entities, and the EO/GI community to demonstrate the effective use of EO/GI data in complementing traditional data systems such as census data, administrative data, household survey data, and vital statistics, to help realise the SDGs.  Both the Committee on Earth Observation Satellites (CEOS) and the Group on Earth Observations (GEO) have established processes aimed at ensuring readiness and support for the SDG framework and can provide practical guidance as required to national and UN agencies. 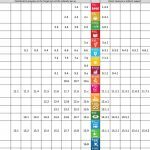 GEO’s EO4SDGs works closely with the Global Partnership for Sustainable Development Data (GPSDD) to help countries align their national priorities to the SDGs, and implement data roadmaps for sustainable development. EO does not deliver any statistical Indicators by default; it provides some spatial, spectral, and temporal information which can then be related to Indicators; it is important for NSOs to identify the best algorithmic approach and statistical applications that are most suited to the use of EO data, based on clear organisational benefits, feasibility of methods and likely cost savings. It is important for NSOs to be able to assess when to use EO data, if appropriate for their statistical purposes to monitor SDGs. A key question is whether the required data or information products can be generated from EO at all. 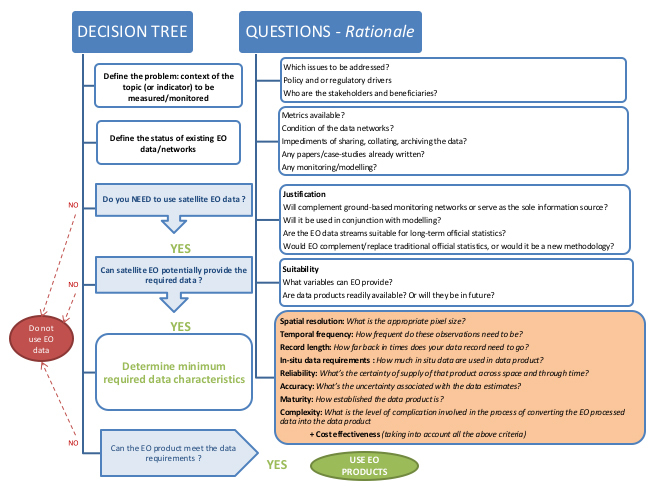 The decision-tree above aims to help the decision as to whether it is appropriate and possible to use EO data products. 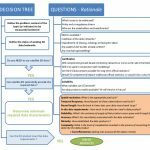 Decision tree on the usage of EO data for NSOs. Click to enlarge. Source: García, Luis; Rodríguez, Juan Diego; Wijnen, Marcus; Pakulski, Inge. 2016. Earth Observation for Water Resources Management: Current Use and Future Opportunities for the Water Sector. Washington, DC: World Bank. © World Bank. https://openknowledge.worldbank.org/handle/10986/22952 License: CC BY 3.0 IGO. The case studies compiled in this booklet illustrate a sample of the opportunities that exist for NSOs and UN agencies to effectively integrate EO data and other geospatial information into the design of their Indicator frameworks for tracking progress more accurately towards the UN SDGs. It also demonstrates how Earth observations can more generally help achieve individual Goals and Targets of the 2030 Agenda for Sustainable Development, as well as the nexus between different Goals. Earth observation and geospatial information can significantly reduce the costs of monitoring the aspirations reflected in the Goals and Targets, and make SDG monitoring and reporting viable within the limited resources available to governments. Beyond the SDG framework, these same data can provide developing countries and regions with increased capacity to acquire, analyse and utilise information for a broad range of policy-making purposes. The increasing capability and diversity of operating EO satellites provide significant opportunity for these data streams to support a large number of the proposed Indicators, bringing more accurate, spatially explicit, and frequently updated evidence. Earth observation-derived monitoring and methodologies are being developed for select SDG Indicators through work done by the UN Inter-agency and Expert Group (IAEG – Working Group on Geospatial Information (WGGI)) and the UN custodian agencies, parts of the UN specifically assigned to develop the best methods to support data collection for specific Targets and Indicators. These methodologies will be integrated into statistical practice standards and manuals and supported by pre-selected ensembles of free and open data sources made available from GEO and other global data stores. NSO’s should plan for incremental incorporation of Earth observations and geospatial data as work is completed on Targets and Indicators by the global community in UN organizations, GEO and CEOS.